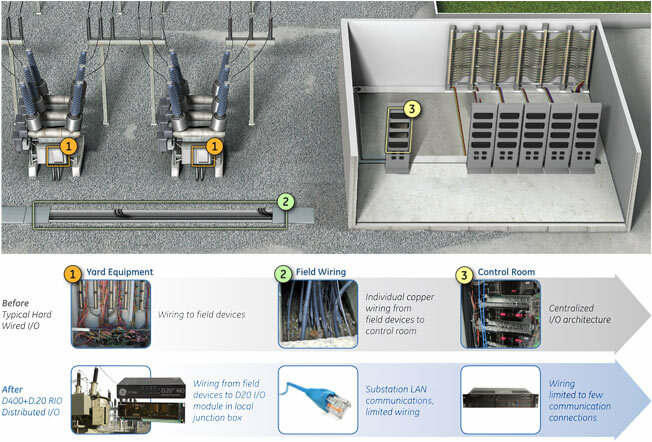 GE's Multilin D.20 RIO Distributed I/O Controller is a stand-alone, small form factor device designed to provide distributed I/O capabilities for easy connection to the Multilin D400™ gateway through any point in the substation LAN. The D.20 RIO provides an interface to GE's Multilin D20 Series of I/O modules. Utilities have large investments in hard wired automation systems. As a piece of equipment ages it fails more frequently, takes longer to repair, and eventually reaches the end of its life. Re-design and forklift replacements require utilities to re-engineer substation designs, replace field wiring, and re-train staff to manage and maintain the system, which is a costly endeavor. 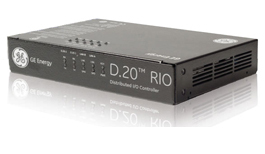 The D.20 RIO Distributed I/O Controller is a small form factor stand-alone device that supports two D.20 link channels for communication with the D20 series of input / output modules. Use the D.20 RIO module to install input / output modules in the substation LAN. No substation LAN? No problem, connect the optional D.20 RIO device directly to the built-in D400 Ethernet switch.